Mrs. ReaderPants: What YA Holiday Titles Are Under Your Tree? What YA Holiday Titles Are Under Your Tree? 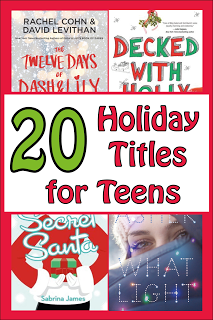 Can someone please tell me why there are so few quality holiday fiction titles for teens? My students request these every December, and year after year, I am unable to meet the demand. There is certainly no shortage of holiday picture books, and there are plenty of adult Christmas fiction titles out there. But there is relatively little for teens. And why, of the few that are available for teens (and adults for that matter), are the majority romances? Does no one get murdered under the mistletoe anymore? Are there no international spies crashing embassy holiday parties dressed as Old Saint Nick? Teens who volunteer at an animal shelter and learn the meaning of Christmas? Where are our Christmas books for teen action fans? Fantasy readers? Mystery? Where are the holiday-themed graphic novels for teens? Doesn't anyone remember that Die Hard, Edward Scissorhands, and Trading Places were all set at Christmas? All light on romance, but look at how successful they were! And where are all the YA Hanukkah fiction titles? Kwanzaa? December traditions from other parts of the world? Authors, if you write a halfway decent, multicultural, December holiday fiction title for teens, I promise you, school librarians will purchase it and promote it! We are ALWAYS looking for stuff like this, and it is a huge hole in an otherwise uber-saturated YA market. To help my fellow librarians, teachers, and parents, I've compiled a list of 20 holiday-themed fiction titles for teens. This list does not include books like Harry Potter or Narnia, which include Christmas as a part of the story but are not themed around the Christmas holidays. Jay Asher is already popular in my library as the author of Thirteen Reasons Why and co-author of The Future of Us. On top of that, the book has a gorgeous holiday-themed front cover and will easily appeal to teens looking for a realistic romance for their holiday break. Goodreads summary: Sierra's family runs a Christmas tree farm in Oregon—it's a bucolic setting for a girl to grow up in, except that every year, they pack up and move to California to set up their Christmas tree lot for the season. So Sierra lives two lives: her life in Oregon and her life at Christmas. And leaving one always means missing the other. This is a go-to every Christmas! You just can't go wrong with alternating-perspective romance set against a New York City backdrop in late-December. Goodreads summary: Sixteen-year-old Lily has left a red notebook full of challenges on her favorite bookstore shelf, waiting for just the right guy to come along and accept its dares. Dash, in a bad mood during the holidays, happens to be the first guy to pick up the notebook and rise to its challenges. If Dash and Lily are popular in your library, then this sequel is a must. It just came out a few weeks ago, and it's on-order for my library. Too bad I'm in China...we'll probably receive these in time for Easter. Goodreads summary: Dash and Lily have had a tough year since they first fell in love among the shelves of their favorite bookstore. Lily’s beloved grandfather suffered a heart attack, and his difficult road to recovery has taken a major toll on her typically sunny disposition. With only twelve days left until Christmas—Lily’s favorite time of the year—Dash, Lily’s brother Langston, and their closest friends must take Manhattan by storm to help Lily recapture the unique holiday magic of a glittering, snow-covered New York City in December. I've just started reading this one, and it's cute enough so far. The main character Charlie is annoying, but I'm guessing she'll come around by the end. A Christmas romance with a Secret Santa subplot, but some characters are Jewish, and Hanukkah is at least mentioned a few times. Goodreads summary: Charlotte Charlie Donovan knows exactly what she wants for Christmas: Teo Ortiz. He's the school's star athlete, in the National Honor Society, invited to every party, contributes to the school paper (where Charlie is co-editor), and is about to be featured as One to Watch in a teen magazine basically, he's exactly the type of guy Charlie s meant to be with. The only problem he barely knows she exists. But Charlie is determined to be Teo's date to the Christmas ball. And she has a plan: To rig the paper's Secret Santa so that she can win his heart with five perfect gifts. But to do that she needs help. Enter J.D. Ortiz Teo s cousin, and possibly the most annoying person on the planet. He's easy going, laid back, unorganized, spontaneous, and makes a joke out of everything the exact opposite of Charlie (and Teo). But he's willing to provide insight into what Teo wants, so she s stuck with him. Hmmm...this one looks very different. A girl miner elf at The North Pole? A "power-hungry, twisted elf with a checkered past"--named Sturd of all things--as the villain? Goodreads reviews are mostly pretty good, but even if it's terrible, I give the author props for exploring new holiday territory. here's even a sequel, The Rise of Sturd. I want to read this based on that title alone. The Coal Elf is currently in paperback on Titlewave...but only for UK customers. It is still available in print and Kindle on Amazon and in print on Book Depository, which has free shipping world-wide. Also the Kindle edition is also on sale in November 2018. Goodreads summary: Ember Skye is a fed up teenage Coal Elf with a big ashy chip on her shoulder. Having been torn away from a carefree life and forced into a world of dirt and darkness has started to get the best of her. And being the only girl-elf working as a coal miner at the North Pole doesn't help much either! Then there's Sturd: a power-hungry, twisted elf with a checkered past and a serious grudge against Ember. Slowly but surely, his maniacal tendencies are revealed, leaving Ember with the sacred "Naughty List" literally in her lap. I do have this title on our holiday display right now, but for some reason, despite many requests for holiday reads, my students don't seem very drawn to this book. Short stories in general aren't that popular in my library, so maybe that has something to do with it. I am doing a holiday booktalk this week, so my challenge for myself is to get this one checked out. The description makes it sound like Hanukkah and other holiday stories might be included. Goodreads summary: If you love holiday stories, holiday movies, made-for-TV-holiday specials, holiday episodes of your favorite sitcoms and, especially, if you love holiday anthologies, you’re going to fall in love with My True Love Gave To Me: Twelve Holiday Stories by twelve bestselling young adult writers, edited by international bestselling author Stephanie Perkins. Whether you enjoy celebrating Christmas or Hanukkah, Winter Solstice or New Year's there's something here for everyone. So curl up by the fireplace and get cozy. You have twelve reasons this season to stay indoors and fall in love. If I were to pick a writer whose books are always hits at Christmas time, it would most definitely be Rachel Hawthorne. We have both this one and Snowed In, and both are easy-sells with my students (girls) at Christmas time. Love those colorful front covers! Goodreads summary: Taking a Christmas cruise with her two cousins from hell isn't Holly's idea of a good time. And when seasickness forces her into an open suite, she's pepper-sprayed by a gorgeous guy called Nick. But when Holly makes her exit, she's greeted by a horde of screaming teenage fans. Because Nick happens to be Dominic Wyatt, drummer for one of the hottest bands in America. Before there were Lifetime movies, there was Lurlene McDaniel. Ms. McDaniel has published books since I was a kid in the 1980s. I can remember reading Will I Ever Dance Again in one night at a slumber party in maybe 6th grade (yeah, I was that kid). She's published well over 50 novels since then and just released a new book, Losing Gabriel in June of this year. If you love sappy, sad love stories that aren't too long or too short, Lurlene McDaniel is a must. --"Christmas Child"--15-year-old Melanie feels cheated when her baby sister, born at Christmastime, lives only a few days. But the brief life of her sister shows Melanie the lasting value of love. --"Last Dance"--Brenda struggles between noble intentions and real desires when she becomes the last chance for happiness for a dying boy. --"Kathy's Life"-- Kathy is beautiful, intelligent, and has the perfect job as a live-in caregiver for a couple's baby boy. But not everything is as perfect as it seems: Should Kathy give up the one person she loves most in the world? Many years ago, my "Christmas book of the year" was Last Christmas by Kate Brian. It was so long ago that it was before I was regularly reviewing books on Goodreads and my blog, which means it was pre-2011. Anyway, I don't remember much about it or even if I liked it. With its Christmas-road-trip-journey-with-the-ex-that-you-still-like-maybe-love-vibe, Ex-Mas does sound like something I would like. Goodreads summary: Seventeen-year-old Lila Beckwith's parents just left for vacation, and Lila's all set to throw the holiday party of the season. But when her Christmas-obsessed little brother, Cooper, discovers that global warming is melting the North Pole, he and his best friend, Tyler, take off on a runaway mission to save Santa. Lila has to get Cooper safely home before her parents get back on Christmas Eve. But the only person who can help her is Tyler's older brother, Beau--a.k.a. Lila's musician, anti-everything ex-boyfriend. Give this to fans of Rachel Hawthorne's Love on the Lifts mentioned above. Goodreads summary: The picturesque mountain ski lodge is the perfect place to spend winter break if you have a boyfriend! Otherwise, that cozy leather couch in front of the crackling fire looks a lot less inviting. Good thing that there are lots of cute, blond, sweater-wearing ski instructors around to choose from. I read this one last year (see my review), and it's pretty good. I love how it tackles homelessness and mental health (schizophrenia, anxiety, panic disorders, depression) in a realistic way. And that the protagonist is a Jewish girl celebrating Hanukkah! Ding, ding, ding! Huge bonus points for a Hanukkah holiday story! Goodreads summary: Right before winter break, fourteen-year-old Molly Rosenberg reluctantly volunteers to participate in Santa Monica’s annual homeless count, just to get her school’s community service requirement out of the way. But when she ends up meeting Red, a spirited homeless girl only a few years older than she is, Molly makes it her mission to reunite her with her family in time for Christmas. And we have a Christmas mystery! Set in England! Whoohoo! Looks like this one is not available in-print on Titlewave, but you can still order it on Amazon and Book Depository. Goodreads summary: It’s Christmas in Port Sentinel, the tiny English town where Jess Tennant has been living for more than a year now. Jess wasn’t sure how she felt about moving to Port Sentinel when her mom dragged her there right in the middle of high school, but even Jess has to admit the town has completely outdone itself for the holidays. There’s a Christmas market complete with mini ice-rink and fairy lights, and the bare trees stand stark against the sky. But for Gilly Poynter, one of Jess’s classmates, the Christmas season is anything but magical. She’s disappeared, leaving behind only her diary and a lot of questions. So this looks fun! A retelling of A Christmas Carol where the Ghosts of Christmas warn a beggar boy against murdering the miserly Ebenezer Scrooge. Awesome! Goodreads summary: Sam and Lizzie are freezing and hungry on the streets of Victorian London. When Sam asks a wealthy man for some coins, he is rudely turned away. Months of struggle suddenly find their focus, and Sam resolves to kill the man. Huddling in a graveyard for warmth, Sam and Lizzie are horrified to see the earth around one of the tombs begin to shift, shortly followed by the wraithlike figure of a ghostly man. He warns Sam about the future which awaits such a bitter heart, and so begins Sam's journey led by terrifying spirits through the past, present and future, after which Sam must decide whether to take the man, Scrooge's, life or not. I have never watched Doctor Who, so I really don't get the craze. But it is a huge craze! Even here in China, I have students who love it! I even got them a new Doctor Who coloring book for our library's coloring station. Goodreads summary: Inside this festive book of Doctor Who stories, you'll find timey-wimey mysteries, travels in the TARDIS, monster-chasing excitement and plenty of Christmas magic. Find out what happens when the Third Doctor meets Jackie Tyler, the Seventh Doctor and Ace encounter an alien at Macy's department store, and the Ninth Doctor tries to get Rose a red bicycle for Christmas. Finally! I found a Christmas horror story! Well, it doesn't look as gruesome as it does creepy. Love that front cover! Amazon summary: When Michael's parents die, he is invited to stay with his guardian in a desolate country house. When Michael spots a woman out in the frozen mists on the day he arrives, he suspects something is not quite right. But little can prepare him for the solitude of the house itself. His guardian is rarely seen, and there's a malevolent force lurking in an old hallway mirror. Michael soon realises that the house and its grounds harbour many secrets, both dead and alive. Goodreads summary: Seventh-grader Mitch Murphy never wanted anything as much as he wanted a Playstation 4. And he was on his way to getting one for Christmas, too. But when his cousins get into a blowout food fight on Thanksgiving, Mitch gets caught in the collateral damage, and they all lose their Christmas presents as punishment. Stripped of the gift he spent the past year obsessing over, all hope is lost for Mitch ... that is, until he discovers where all of the their presents are being stashed. Now, Mitch must corral his motley crew of cousins to help him pull off a heist to steal their Christmas--and his PlayStation--back. Three interconnected holiday stories by three popular YA authors, all together in one book. Apparently, a movie is planned for 2017. After reading the summary, I kind of want to read it! Goodreads summary: A Christmas Eve snowstorm transforms one small town into a romantic haven, the kind you see only in movies. Well, kinda. After all, a cold and wet hike from a stranded train through the middle of nowhere would not normally end with a delicious kiss from a charming stranger. And no one would think that a trip to the Waffle House through four feet of snow would lead to love with an old friend. Or that the way back to true love begins with a painfully early morning shift at Starbucks. Summary : It's a snowy Christmas Eve, and someone has stolen over $10,000 from the grocery store charity box. Instead of being allowed to go home, Chloe and her five coworkers are locked in work jail (aka the break room), waiting for the police to come and question them about the theft. Is there ANYTHING better on Christmas morning than a brand-new coloring book and a set of brand-new sharpened colored pencils? Santa brought my sisters and me a new coloring book every year, and we still love them! So happy to pass this tradition on to my boys! Amazon summary: Filled with happy, celebrating kawaii children, kawaii alpacas, kawaii unicorns and so much more. Printed on one side of large 8.5 x 11 inch pages. Also includes free bonus bookmarks and gift tags to color and cut out! 64 pages. holiday fiction titles for teens? Please share! Here are some that I have on my shelf for middle school. Some are rather old. I forgot about All Wrapped Up! Holly Smale is very popular in my library! I just found a paperback copy of Mistletoe: Four Holiday Stores by Hailey Abbott, Melissa de la Cruz, Aimee Friedman, and Nina Malkin at my local used bookstore. I love anthologies and I was wanting to read this one personally so I picked up a copy for my library. It was published in 2006 and the pop culture references are definitely dated. I read it in a couple of hours this weekend and while not exactly my cup of tea, the love stories were serviceable and teens might enjoy them. The writing was a little too focused on what people were wearing and name dropping designer labels for me. The best of the bunch was by Melissa de la Cruz which I believe was a retelling of The Gift of the Magi. Cruz's story was very sweet and it was worth reading the rest to get to it. Yet another book of Christmas love stories! Christmas love stories are fine and popular with my students, but some diversity would be good, too. Even the adult Christmas books tend to be a lot of romances. Wow, guess I will have to write something! Challenge accepted. Awesome! I'll be happy to do a review! Ann Martin's "On Christmas Eve"
Agatha Christie's "Hercule Poirot's Christmas"
Greg Neri's "True & Nelle: A Christmas Tale"
Kate Wiggins' "The Birds' Christmas Carol"
Dave Barry's "The Shepherd, The Angel, and Walter the Christmas Dog"
Henry Van Dyke's "The Other Wiseman"
--and my personal all-time favorite - Truman Capote's "A Christmas Memory"
Great list, Mary Ann! Isn't it a shame that there aren't more new titles for the holidays? Thanks, tarafarah7! Happy to have you along!